Jacques Demy's follow-up to Les Parapulies de Cherbourg is a large-scale tribute to the Hollywood musical. 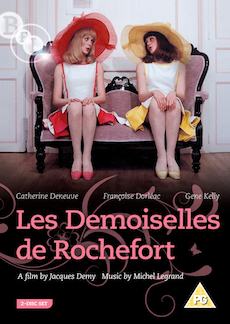 Following the huge success of Les Parapulies de Cherbourg (1964), Jacques Demy went on to make Les Demoiselles de Rochefort, a large scale tribute to the Hollywood musical featuring screen legend Gene Kelly. The 1996 restoration is presented in a two disc set that also features an hour long documentary by Agnes Varda and other special extras. Jacques Demy was one of the most distinctive directors to emerge from the French New Wave in the late '50s and early '60s. The films he made up until his untimely death in 1990 constitute one of the most extraordinary bodies of work of that era, much of which was screened in a career retrospective at BFI Southbank last November. Les Demoiselles de Rochefort centres on twin sisters Delphine and Solange (played by real life sisters Catherine Deneuve and Francoise Dorleac). Tired of their humdrum existence in the picturesque seaside town of Rochefort, they dream of leaving to find success and romance in Paris, just as a carnival and an American composer (Gene Kelly) hit town. The superb ensemble cast also features Danielle Darrieux, Michel Piccoli, Jacques Perrin, George Chakiris and Grover Dale. With a plot of pure Shakespearean farce, witty dialogue and lyrics by Demy and a magnificent jazz score by three-times Academy Award winner Michel Legrand, this has to be one of the most joyously ebullient movies ever. Les Demoiselles ont eu 25 ans ( Agnes Varda, 1993, 64 mins) - documentary mixing on-set footage, home movies and footage from the 25th Anniversary celebrations in Rochefort.